In other words, Hemingway’s approach to writing description is to give you just enough (the tip of the iceberg) to let you figure out what’s going on. The lights grow brighter as the earth lurches away from the sun, and now the orchestra is playing yellow cocktail music, and the opera of voices pitches a key higher. Laughter is easier minute by minute, spilled with prodigality, tipped out at a cheerful word. The groups change more swiftly, swell with new arrivals, dissolve and form in the same breath; already there are wanderers, confident girls who weave here and there among the stouter and more stable, become for a sharp, joyous moment the center of a group, and then, excited with triumph, glide on through the sea-change of faces and voices and color under the constantly changing light. Suddenly one of the gypsies, in trembling opal, seizes a cocktail out of the air, dumps it down for courage and, moving her hands like Frisco, dances out alone on the canvas platform. A momentary hush; the orchestra leader varies his rhythm obligingly for her, and there is a burst of chatter as the erroneous news goes around that she is Gilda Gray's understudy from the Follies. The party has begun. If you want to succeed in writing description Hemingway-style, you need to master the art of picking just the right detail to represent a hundred other details. If you want to do it Fitzgerald-style, you must fashion the eyes of a poet. Thankfully, most of us approach description from somewhere in the middle of these two demanding extremes. 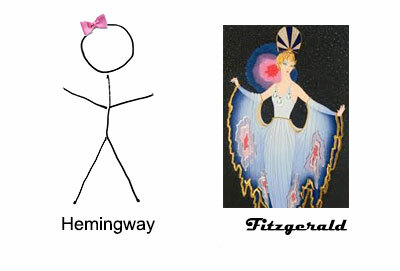 Note the thing Hemingway and Fitzgerald share: details. Hemingway gives us the tree shadow made by “electric light.” Fitzgerald gives us the “lights grow brighter,” “yellow cocktail music,” “the sea-change of faces,” and, of course, “in trembling opal” (the best description of a dress ever, IMO). The point of description is to allow the reader to “experience” the story; the reader’s imagination cannot grow on meager fuel like “The room was big.” It doesn’t help to say it’s “cavernous” or “massive” or “awe-inspiring,” either. Give the reader’s mind details, like the scratched, rotting wood barely holding up the vaults of the cathedral ceiling, the echoes bouncing through the empty space with each clack of a high-heeled shoe, or the itch in your eyes from the long layers of old dust. Notice those last two examples? I used sound to provide a visual detail, and then I used touch/sensation. The #1 biggest mistake new writers make in writing description is to use only sight (for objects) and sound (for noise). That’s the way we experience a TV show or movie. Life involves dozens of senses, particularly taste, smell, and touch, but also emotional senses, like feelings of dread or the sense of being lost. Humans constantly orient themselves (sense of direction) and pick up on social cues (sensing something’s wrong in the room). Life is visceral, not cinematic. The best descriptions don’t just convey a sense of things, they invoke that sense in the reader. See? Three steps. It’s easy. No, wait. It really, really isn’t.